A beaded pendant made of seed beads size 11/0, different size of crystlas and fishing line. * This tutorial is for a miniature pitcher. The height will be 4 - 4.5 cm and the diameter of the belly will be 2 cm. * I offer the pattern, not the pendant. * If you are a beginner in doing beaded creations, this pendant is just perfect for you. You can use it either with a chain or you can combine this design with your other design such as bracelets, and earrings. * PDF includes over 170 photos and detailed explanations of each step. Please do not hesitate to contact me if you have any questions and/or concerns. Your satisfaction is my priority. 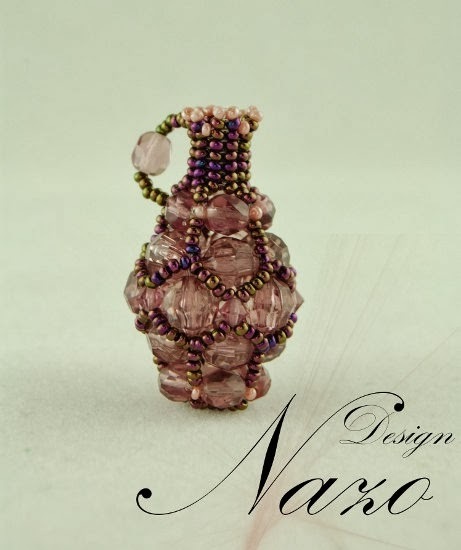 Pattern is tested and created by Nazo Design®.